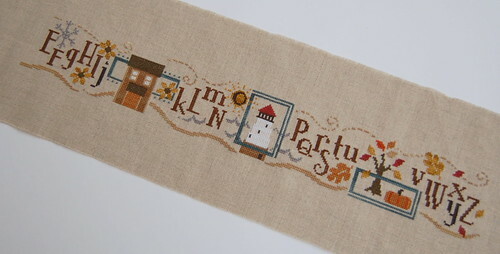 I'm still stitching away on Bent Creek's "Seasons of Change Row." I'm on the winter section now, which is the last season. It looks great, and near to completion. Very nice design. This is a great design...I don't think I've ever noticed it before. And it looks like you are almost finished...good job! Nicole, I love your new banner! Beautiful stitching! I love that design! I hope you get to feeling better soon. Believe me, I know what you mean. No sympathy at all around my house either when I am sick! LOL, I guess its part of being a woman! It's looking fabulous, the colours are so rich, very pretty! hope you start feeling better .. I'm sick too ..not fun! I love your BC Row. You'll have it finished in no time. Hope you feel better soon. Lovely work, Nicole, can't wait to see the finished piece. And you need to take care of yourself--as said before, the laundry isn't going any place on its own--it will be there when you feel better, and I hope that's soon. Nicole, that is so pretty! I love the colors in it. Hope you are feeling better soon. I hear you on the laundry, just remember that it will happily wait for your attention! Very cute, Nicole! What are you going to start on next? Wow Nicole you have a pretty new header in your blog!!! It is just lovely! Your Bent Creek project looks just splendid as well! I hope you are feeling better!! This weather is making all of us sick at some point but I hope you just get better and better!! It is coming along nicely. You will be done before you know it! I love this. You have such good taste! Sending you sympathy and hoping you're feeling better! Great progress on your BC piece! Looking good, Nicole. Hope you get over your cold soon!